This is fish fingers and peas for adults; make some chips, too, if you like. Need I say, this is not a Middle Eastern concept, except for the chermoula bit the crust contains the ingredients of a Moroccan lemon, herb and cumin marinade used with fish. If you're not keen on peas, serve with salad. These delicately spiced fish fingers are also very good with saffron mash and roast vine tomatoes. I've used salmon, but prime cod fillets taste equally good, if you prefer. Prepare the crust pour the couscous into a small bowl, level out, and pour boiling water over to cover. Leave for 5 minutes. Fluff up with a fork and spread out on a plate and leave to cool. Return the couscous to the bowl and mix with the salt and pepper, garlic, lemon zest and spices. Season the salmon fillets. Dip in flour to coat, then into the beaten egg and finally into the spiced couscous mixture. Wrap in clingfilm and chill until required. Cook the peas in boiling salted water for 5 minutes. 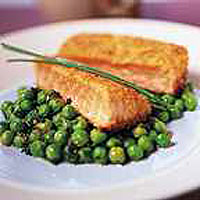 To cook the salmon, fry gently in a little olive oil for about 2 minutes on each side. Slice each fillet in half lengthways to make two 'fingers' for each serving. Drain the peas and toss with the mint, butter, chopped chives and mustard. Serve with the fish fingers and garnish with the whole chives.